Yesterday’s episode of Legends of Tomorrow was titled and introduced “The Justice Society of America,” the first superhero team in history. But who are the JSA and what’s gone on with them over the years? And how does the Legends of Tomorrow version stack up? Let’s find out. Their first meeting was simply that: a meeting, one where they each tell a tale of their own solo adventure. In later issues, the team would gather together, learn about some mission, and then split up again, with the book following each character on their individual solo mission. Eventually, though, the writer, Gardner Fox, allowed the team to stay together or work in pairs. The book was mainly for characters who weren’t popular enough for their own books (which is why neither Superman nor Batman were part of the JSA when it appeared) and often when a character became popular enough for their own book, they were dropped from the JSA and replaced with another character. After all, Allied and National had enough characters to go around and they included as many as possible: from Black Canary to Hawkgirl to Starman. Even Wonder Woman was a member, although she was only the secretary for the longest time (William Moulton Marston didn’t want anyone else writing her adventures except for him, which meant she was sidelined for the longest time in the book). The team and the book, All-Star Comics, survived for quite a while, all the way through All-Star Comics #57. Along the way, they battled supervillains like the Wizard, Per Degaton, and the Injustice Society, but time and disinterest in superheroes finally caught up with them and All-Star Comics was renamed All-Star Western. It was 1951 and nobody cared about the JSA anymore. The Super Squad and Infinity Inc.
Thankfully, the Silver Age then came along and superheroes became popular again, starting with the new Flash. And as the new Flash got his own title, in 1961 he found himself crossing over into a completely different Earth and meeting the Flash of Earth-2, Jay Garrick. Soon, the new superteam, the Justice League of America, was meeting the old superteam, the Justice Society of America, and teaming up with each other to defeat the evil superteam from Earth-3, the Crime Syndicate of America. The JSA’s disappearance in the ‘50s was even explained in an issue of Adventure Comics: the team had retired for a while because the House Un-American Activities Committee had insisted that they unmask and they had refused. The popularity of these stories eventually coalesced into a revival of All-Star Comics in 1976, where the Justice Society mentored younger heroes called the “Super Squad,” like the Star-Spangled Kid, Robin, Power Girl, and the Huntress until they were ready to join the JSA. What was unusual about these stories was that it seemed that, unlike the Earth-1 heroes, the Earth-2 heroes were all aging at a regular rate. The heroes who had served in World War II were now in their fifties. Heroes like Batman had retired or died and left the vigilante business to their children. These were characters that were allowed to age, retire, and even die. After awhile, however, this aging became problematic — people still wanted to read about their heroes, but they didn’t want to read about old people. To that end, two books were developed and written by Roy Thomas: All-Star Squadron, about the JSA during their prime in World War II, telling stories that hadn’t been told before, and Infinity Inc., which took place in the modern day Earth-2 and was about the JSA’s children taking their place. It starred Jade and Obsidian (Green Lantern’s daughter and son), Nuklon (the Atom’s godson), the Silver Scarab (son of Hawkman and Hawkgirl), and the Fury (daughter of Wonder Woman and Steve Trevor). Although All-Star Squadron ended in 1984, Infinity Inc. was popular enough to stick around in 1988, sticking around for two years after the Crisis on Infinite Earths. Unfortunately, while they stuck around, the JSA couldn’t. In the aftermath of Crisis on Infinite Earths, DC wanted to remake their universe to be less confusing. Unfortunately, having a superhero team from the ‘40s exist in the present day was something that didn’t fit in with that concept. 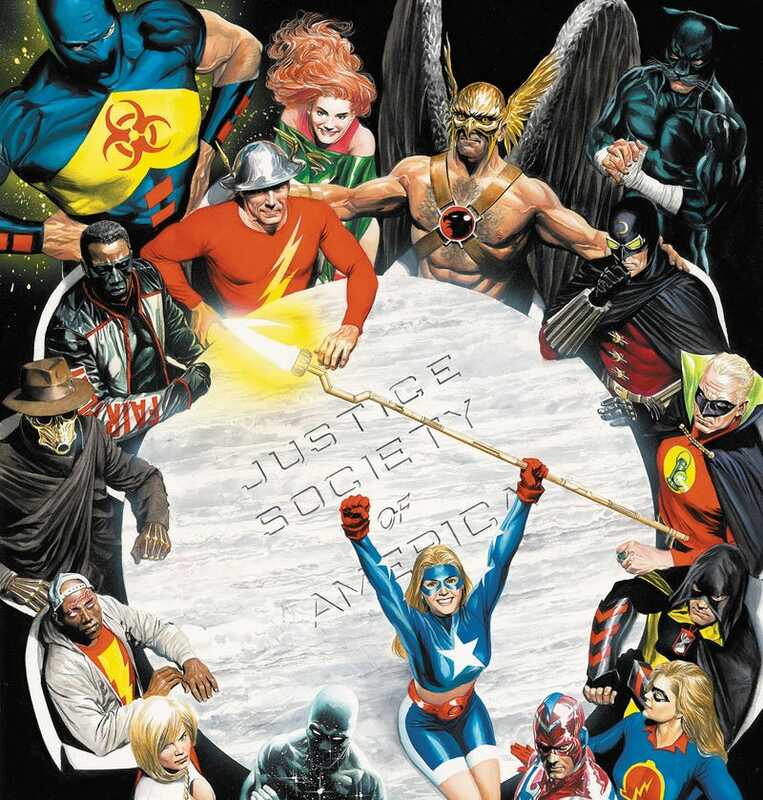 So the JSA had to go — but instead of simply wiping them out of continuity, like they had with the Earth-2 character of the Huntress, they gave them a proper sendoff, the Last Days of the Justice Society of America Special, written, of course, by Roy Thomas. In the special, the JSA suddenly begin to remember in the 1940s when Hitler had the Spear of Destiny and used it tie the war with the outcome of mythical Ragnarok...thereby destroying the world. In order to stop this, Doctor Fate pulled the JSA into Asgard and had them change Ragnarok...but they would have to stay there and keep doing so eternally for it to work. And so the JSA was now gone, out of sight, out of mind. Until a few years later when it was decided to bring them back. They got their own series in 1991, which was cancelled even though it sold well (the writer explained that it was because the editor hated the concept of “senior citizen superheroes”), and managed to introduce another legacy character: Jesse Quick, daughter of JSA member Johnny Quick. The JSA would stay in the background until finally getting their own book again in 1999. Which is when they would become awesome again. The new JSA book was handed off to two writers: James Robinson, who had hit it big with Starman, and David Goyer, a longtime fan of comics. Robinson would leave after five issues to finish writing the finale of Starman, leaving the book to Goyer and another writer named Geoff Johns. Johns’s run on the title is often considered one of the very best runs of any comic. It includes deep dives into the history of the DC universe, bringing back obscure characters, and using complicated plotting and deep characterization to plan long-term storyarcs that would culminate in supremely awesome moments. The series, like the ‘70s All-Star Comics, was about the older JSA members mentoring the new ones, but this time there was an added element: the older members were trying to make up for their own mistakes. Alan Scott was trying to fix the fact that he had been an absent father to his children. Jay Garrick had never been able to have children of his own. The book was about more than just the JSA; it was about legacy and what we leave for our children. The book lasted all the way until 2006 when, in the wake of Infinite Crisis, it was relaunched as Justice Society of America. From there, it lasted another five years until 2011 when DC did another reboot and created the New 52. Unlike the Crisis on Infinite Earths, the New 52 reboot actually did erase the Justice Society from existence. Gone were any superheroes from World War II. All the heroes started five years ago and that was that. The JSA as a concept though was still workable for DC and they brought back James Robinson to remake it: this time, the book was called Earth 2 and the Earth it took place on had gone through a disaster, an invasion by Apokolips and Darkseid that had been barely rebuffed, but had resulted in all of the superheroes dying. So in this world, suddenly younger versions of Jay Garrick and Alan Scott are given powers; Jay is given speed by the god Mercury, while Alan is connected to “the Green.” (Alan is also gay in this world, since James Robinson felt kind of bad for erasing Obdisian, his gay son.) Pretty soon, they formed a team along with Hawkgirl — but they weren’t called the Justice Society. Instead, they were called what the previous heroes were called: the Wonders of the World. Earth 2 ended up lasting 32 issues before being relaunched as Earth 2: Society. Robinson left the book due to editorial changes. The actual Earth 2 was destroyed by another invasion and the characters moved to another planet. The book swiftly changed writers. It seemed, really, that no one could really make the concept work again. And so we return to the main DC universe with DC Rebirth. Not a reboot, but a return to legacy, written by Geoff Johns in 2016. As the original Wally West is slowly being absorbed into the Speed Force, he tells an elderly Johnny Thunder that he must find the Justice Society of America. So we know that the JSA still exists. What happened to it remains a mystery. Legends of Tomorrow’s JSA is different from the comics. It appears to be comprised of regular members of the JSA, along with some variations. Instead of Alan Scott/Green Lantern, we have his son, Todd Rice/Obsidian, who is better known as a member of Infinity Inc. Instead of Starman, we have Stargirl, who comes from the modern, 1999 incarnation of the JSA. Hourman, Commander Steel, and Doctor Mid-Nite were all regular members of the JSA (although Mid-Nite was white in the comics), but Vixen, however, was never a member. Their function, however, is pretty much exactly the same: they are superheroes who fight against the Third Reich, doing jobs for FDR while their headquarters are in a New York brownstone. All of that is completely accurate. So here’s hoping we see more of the JSA and we get to see more of their members. Perhaps they can even get Jay Garrick to join.